Located in the new center of Da Nang, it’s been a dream come true for us to build, establish and open this spectacular hostel. Got inspired from the Kon-Tiki expedition, a journey by a raft across the Pacific Ocean from South America to the Polynesian islands, we wish to make a place not only for staying but also a place to make wonderful memories. 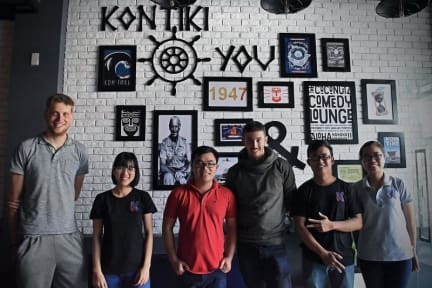 Kon-Tiki offers both dorm and private rooms, all of which are air-conditioned during the night to ensure you have a comfortable nights sleep. - Outdoor roof terrace with a great street scape view. We have an awesome staff who are ready to help with all your travel needs. Don’t hesitate to ask us anything. We are happy to help.